Here is OB photographer Joe Ewing’s photo run by the OB Rag, reposted by the LA Times on July 1, 2014. The photo is of the 2013 marshmallow fight. Editor: Tony Perry, friend and San Diego stringer for the LA Times posted his take on OB’s marshmallow controversy in today’s Times. The Times also posted an OB Rag photo by Joe Ewing, and quoted the OB Rag in a statement no one here on staff recalls making, anywhere in the numerous articles the Rag has published about the marshmallows. 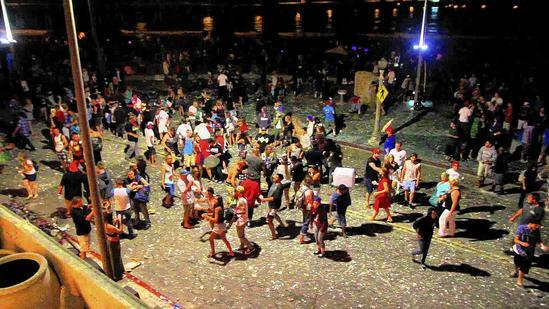 Since the mid-1980s, residents of the Ocean Beach community of San Diego have enjoyed a unique Fourth of July free-for-all: a marshmallow fight after the evening display of fireworks. But the sticky, gooey mess left behind in recent years has increased calls to abandon the tradition. In that time, the spontaneous, leaderless event has gotten more aggressive, spreading from the beach to the main business street of Newport Avenue and then to surrounding streets. The mess left by countless marshmallows has been unsightly and substantial. Finally, after much civic discourse, the Town Council, a private, nonprofit group, agreed. Tim Rasmussen, 31, manager of the Humble Hippie, which sells posters, tie-dyed T-shirts and other “comfortable clothing,” said the marshmallow fight has become “15 minutes of fun and a month of cleanup.” He also noted that marshmallows are not good for the gulls that forage the beach. Stores are being encouraged not to sell marshmallows on the Fourth and certainly not the marshmallow “guns” that transform the little blobs of sugar into projectiles. People should be able to come to Ocean Beach “without worrying about having a marshmallow fired at their head,” said Town Council member Dave Cieslak. A frozen marshmallow or one coated with sand is particularly dangerous, he said. But Mallow Out supporters acknowledge that ending the marshmallow fight in one swoop may not be possible. The Town Council has no legal authority to end the event, so it plans to have a “Peace Patrol” of volunteers on the Fourth pleading with people to voluntarily relinquish their marshmallows. And there is a counter-movement to somehow restrict the marshmallow throwing to the beach, although that would run counter to Ocean Beach’s libertarian strain. An OB tradition as honorable as sucker punching drunks on Newport. No true Obetian condones polluting our beach and leaving that mess for those that respect what OB is truly about. Thanks to the OB Rag and it’s leader, Frank Gormlie, for helping to get the word out about the Mallow Out. It is a testament to the local media here, that they were willing and able to work with the OB Town Council and various volunteer groups, to publicize the intent to keep the streets, beaches, and Veteran’s Plaza clean & marshmallow free. Still waiting for the apology for the OB Rag’s change in editorial stance, and the apology from the OBTC for “RIP Marshmallow Wars 1985-2013”, which turned out not to be true.